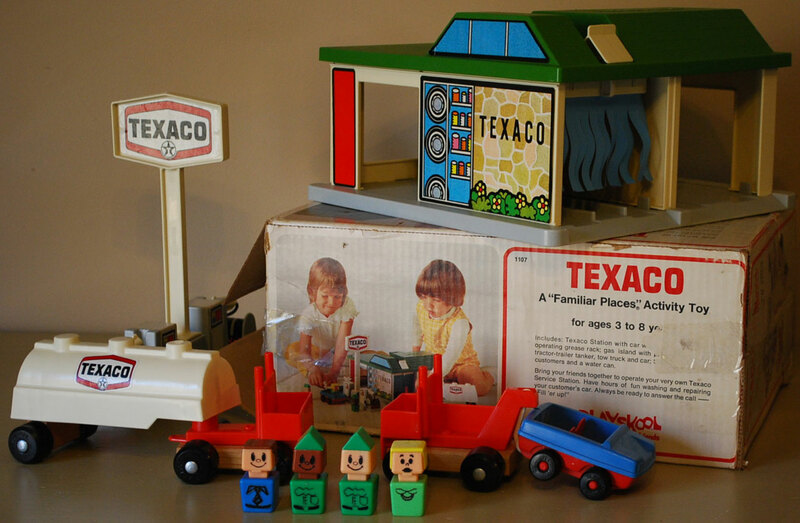 Aisle A: Playskool: "Familiar Places" and "Play Friends"
Description: This 1975 Sears Exclusive Texaco playset is resembles a real Texaco gas station! 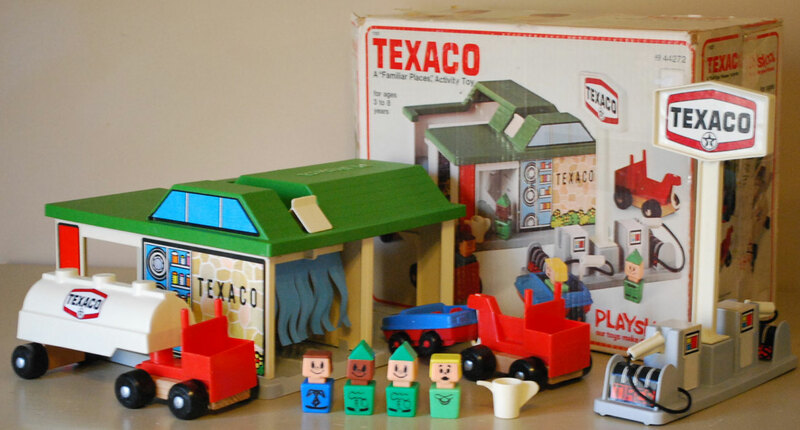 Bring your friends together to operate your very own Texaco Service Station. Have hours of fun washing and repairing your customer's cars. Always be ready to answer the call -- "Fill 'er up!". PSKB1107 - Texaco Station - Square white Texaco service station building with a green roof and grey base. 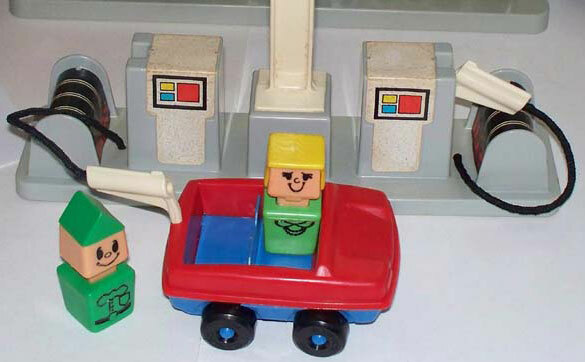 The service station includes a car wash with blue hanging moveable wipers and an auto eject, a mechanics shop with a movable grease rack (attendant figure fits under raised grease rack to service car), and a store/check out area with a pretend cash register and bathroom doors. Push button located between bathroom doors tilts auto eject ramp inside the car wash.
2 each - Sky Windows - Blue 3-pane window with black edges (2 white vertical pane dividers). The center window is rectangular, top corner of each outer window is angled. Litho fits on each outside edge of raised roof area. Entrance Wall - Large rectangular litho with a light yellow/orange "rock" wall with yellow flowers and green bushes at the bottom. The rock wall is marked "TEXACO" in the center in black. The left side of the litho has a blue window picturing a stack of tires and shelves of cansc inside. Litho fits on outside wall (beside car wash), under sky window litho. Entrance Wall 2 - Small red rectangular litho with a black edge. Litho fits on far left outside wall (beside car wash), by doorway/window opening. Mechanics Shop Green - Wide green rectangular litho with a wide white desktop, a purple stool and 3 drawers under the desktop, and a yellow oil can, and red/blue/yellow cans on top of the desktop. Litho fits on long wall inside the mechanic shop. Mechanics Shop Pink - Pink with with tire on wall, and roll-under caddy on the floor. Litho fits on short wall inside the mechanic shop (by the grease rack). Cash Register - Square yellow litho with a small yellow square above one corner, black edges, and 5 multi-colored "keys" in the center. Fits on molded-in cash register inside the store. Products - White shelf with orange background and cans of products on top of the shelf. Fits on wall above cash register inside the store. PSK95 - Gas Island - Grey gas island with a long rectangular base. 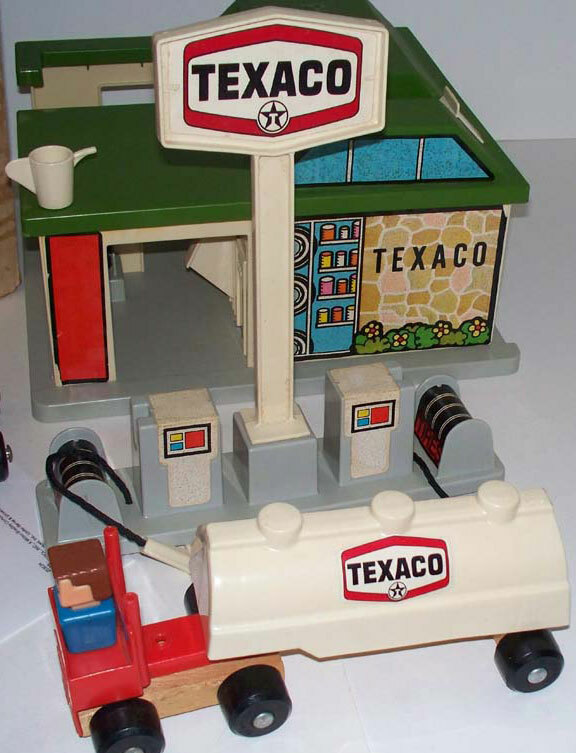 Has a raised square in the center (+ shaped hole in center of square to attach Texaco sign), has a squared gas pump on both sides of the sign square, and a tire rack on each end of the gas island. Both gas pumps have an attached black hose (shoestring attached to base between gas pump and tire rack) with a white plastic gas nozzle on the end. The nozzle fits info a hole on the side of the gas pump. 2 each - The top and 2 sides of both gas pumps have a white litho (1 litho fits across top and both outer sides) shaped like a gas pump with red, yellow, blue squares on the pump "face". 2 each - Each tire rack is covered with a black litho with white lines (to resembles tire ends) and a red sign on the outside marked "TIRES" IN BLACK". PSK96 - Texaco Sign - Tall white plastic sign with a red/white/black Texaco logo (litho) on both sides of the sign. The sign has a long white signpost and a square base. The base has a rectangular tab in the bottom center (fits into slot on the accessory gas island or top of the Texaco Station base). Measures about 10" tall x 4" wide. PSK97 - Water Can - Small white plastic water can with a small round pour spout on one side, and a large handle-shaped tab on the other side. PSK98 - Tractor-trailer Cab - Small rectangular WOODEN block with a red plastic cab attached to the top and with 4 black wheels (marked "Playskool") attached via metal rivets. The cab has a rectangular front seat (seats 2 figures), a tall backrest, and a tall smokestack on the top of each corner of the backrest. The back of the vehicle has a round upright peg (to attach Texaco tanker). PSK99 - Tractor-trailer Tanker - White plastic rounded top fuel tanker with a red/white/black Texaco logo on both sides. The bottom back has a rectangular wooden axle with a black wheels on each side (wheels marked, "Playskool"). The bottom front has a hole to fit onto the peg on the tractor-trailer cab. PSK100 - Tow Truck - Small rectangular WOODEN block with a red plastic cab attached to the top and with 4 black wheels (marked "Playskool") attached via metal rivets. The cab has a rectangular front seat (seats 2 figures), a tall backrest, and a small boom on the back with an attached white plastic hook. Car - 4-seat car with a GAS HOLE. Measures 3-3/4" long x 3-1/8" wide x 1-3/4" tall. See Variations below for color options. PSK101 - Texaco Service Station Attendant - Causacian Green base, green triangular hat, chest design: Green Bowtie, 3 black Buttons, Green Pocket, Black Belt w/ Green Buckle. PSK102 - Texaco Service Station Attendant - African-American Green base, green triangular hat, chest design: Green Bowtie, 3 black Buttons, Green Pocket, Black Belt w/ Green Buckle. PSK8 - Green base, yellow hair, MOUTH OPEN, chest design: Curved collar, Pearl necklace. PSK103 - Blue top, red base squared car. The red interior is square with a seat backrest divider in the center (can seat 4 figures). Rolls on 4 black wheels marked "Playskool". Wheels have red center rivets. The top back edge of the car (top/center edge of back seat backrest) has a GAS HOLE. Measures 3-3/4" long x 3-1/8" wide x 1-3/4" tall. PSK104 - Red top, blue base squared car. The blue interior is square with a seat backrest divider in the center (can seat 4 figures). Rolls on 4 black wheels marked "Playskool". Wheels have blue center rivets. The top back edge of the car (top/center edge of back seat backrest) has a GAS HOLE. Measures 3-3/4" long x 3-1/8" wide x 1-3/4" tall. Featured in 1975 Sears Christmas Wishbook (page 488) - price $11.95. Featured in 1977 Sears Christmas Wish Book (page 490) - price $7.95.